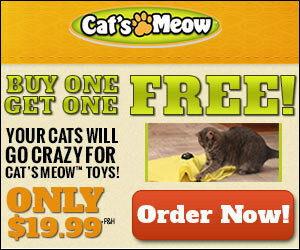 Why would anybody want this "toy" designed for taunting your cat? seems mean. After watching for two seconds I already feel bad for the cat. It kind of reminds me of the mechanical rabbit they use at dog tracks in order to get them to race. Unless you want to sadistically make fun of your cat for continuously chasing after the fake mouse to no avail, what's the point? Also, while watching this I was absolutely certain the price was going to be $19.99, and that if I called now I'd get a second one free (I'm really at a loss as to why someone might want two of these). It reminded me of an old episode of The Cosby Show; Cliff is sitting in front of the TV late one night and yelling at an ad for something like a "wonder mop," knowing it's going to cost "only 19.95." Unfortunately I could't find the clip on youtube. Related: "Forever Lazy" is out of their mind with their marketing.